Henning, Minnesota, formerly known as East Battle Lake until 1884, has a population of just over 800 and is tucked away in the heart of Otter Tail County. The area is located 35 miles east of Fergus Falls, 76 miles from Fargo, ND and 177 miles from Minneapolis. 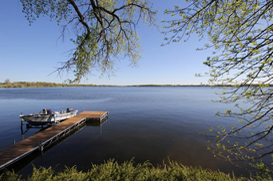 With over 1,000 lakes in the county, Henning lives up to its motto “Gateway To The Lakes.” This welcoming community enjoys the small town rural life with the benefits of beautiful scenery, excellent services and schools, and friendly neighbors. The homes in the area are more mature with the property values and taxes are on the lower end of the spectrum compared to many other places in the state. Properties with values toward the higher end of the spectrum can be found in the West and East Battle Lake areas nearby and can run upwards of a million dollars. Lakeshore is plentiful! In fact, the region looks like a series of puddles from the air. Other home options in the area include both traditional and modernized houses in town or private, scenic country homes. For a closer look at the available homes on the market, we can help you meet your real estate goals in the coming year. The Henning School District takes prides in their K-12 school and includes the communities of Henning, Vining and rural Ottertail. They offer quality education, athletics, as well as extra curricular activities. The closest four year college is the University of Minnesota Morris which is an excellent choice for a liberal arts degree. If you’re looking for a two year college, the M State Campus at Wadena, Detroit Lakes, Fergus Falls and Moorhead are all very close. Henning, Minnesota also has a number of churches in the vicinity. For those seeking medical treatment, the town has a skilled nursing care facility, dental practice, eye clinic, medical clinic, chiropractic treatment office and excellent ambulance service. There are over 25 volunteers that work the Fire Department in Henning where they are dedicated to providing the area with the best service. Other top industries in the area include construction, manufacturing, retail trade, education, and food services.